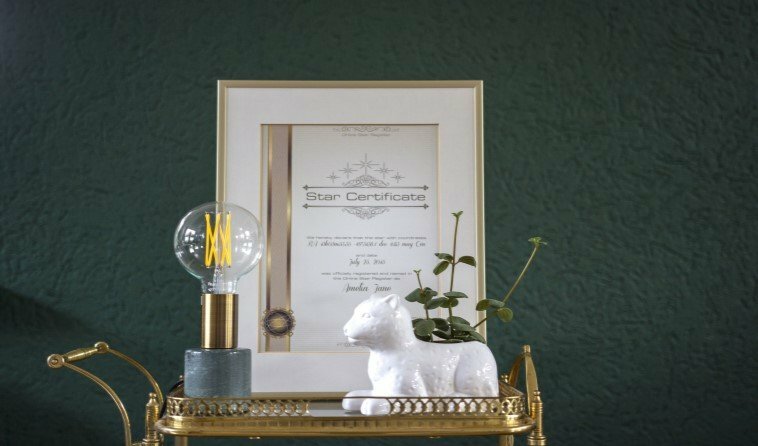 Showcase your star certificate; how to choose the perfect picture frame. You have received the OSR personalized star certificate with your unique star coordinates, star name and star date. Now you would like to show off your personalized star certificate in your home. Customers regularly ask us for the best possible way to frame their certificates. This step-by-step explanation shows the best way to frame your OSR star certificate. The following tips on how to frame your certificate are also applicable when framing a painting, diploma or poster. Framing your certificate is a beautiful way to remind you of your unique gift. 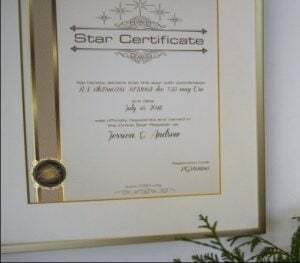 The personalized star certificate is printed on luxurious thick paper with gold foil imprinting. The certificate is part of the OSR Gift Pack, with which you also receive a personalized letter, an OSR code explanation sheet with explanation of your newly appointed star which includes a glow-in-the-dark star sticker. The gift pack includes a rotatable star map, where you can find the coordinates to your newly named star. With your star registration, you will also have access to your own customized star page, the OSR Universe, the Star Finder and One Million Stars app. When choosing a picture frame, first think of where to place the frame. Would you like to hang it on the wall, or put it on a shelf? Pick a spot with a lot of natural light, as is brings out the detail in the certificate. We recommend to not place the certificate in direct sunlight, as colors may fade over time. A picture frame showcases best when placed in a decluttered area. Keep it simple, you want to draw attention to your unique star name and star date. Do you want to showcase your certificate to people visiting your house? Then pick a spot where visitors pass by, for example the hallway or above the kitchen table. Consider whether you want to show your certificate in a custom frame, or a standard frame. Customized frames are usually compiled at a specialty framing store. The specialty store has a wide variety of choices. They can even help you make the best choices for your document. Standard frames can be purchased at almost every home and accessory store. Pro tip: Bring the document with you when shopping for a picture frame. There are also different types of glass to choose from. You can either go for clear glass or non-glare glass. The difference is in the reflectiveness of the glass, and of course the price. We have opted for a gold picture frame of 30 by 40 centimeters with clear glass. This cost us about $ 17,-. For a frame with non-glare glass you pay about double the amount. The dimensions of our standard frame differs from the most common print formats. Our star certificate is A4 size. A4 is 8,3 inches by 11,7 inches. There is no standard frame available in that size. Therefore we decided to opt for a passe-partout, also known as a picture mount. A passe-partout is a cardboard window, or border that is used in a picture frame to make the image fit. These are available in all colors and standard sizes. Usually, they are cut to size with a small overlap highlighting the document. Our passe-partout cost us $ 9,- including cutting it to size. First make sure your work surface is dust free. You can frame on any flat surface, such as a table. Always put down your documents with the text or images facing up to prevent the surface from getting dirty or scratched. It would be a shame if anything would happen to your certificate that could have been avoided. Disassemble the parts of the frame on your working surface. Clean the glass plate with a special cleaning agent suitable for the streak-free cleaning of glass. If you do not have this, gently blow over the glass plate and rub it over with a dry cloth. Do not use cleaning agents that leave a film, as this may affect the document. Now take the glass part of the frame with the front facing down. Carefully place the certificate in the frame with the image facing down. Take the back part and lower it slowly onto the certificate. Finally close the clips, and the frame is ready to hang on the wall. First determine the height at which you want to hang the frame. The best possible way is to hang it at eye level, where the eye is drawn to the beautifully framed document. Mark the spot where you are going to hang the frame. Measure the distance from the suspension system to the middle of the frame and make a mark at the height of the suspension system. This mark is where the screw or nail has to be placed in the wall. When you are done with the markings you can start drilling a hole for the screw. If it is not an option to hang the certificate on the wall, your certificate looks just as nice placed on a shelf. You did your best to frame the certificate. Now it is time to enjoy your personalized star certificate. Congratulations! Your star certificate is hanging on the wall in its beautiful picture frame. Would you love to give a star gift to someone special? Name a star now! - Showcase your star certificate; how to choose the perfect picture frame.